Belbin’s analysis sheds brilliant light on the source of so much confusion and disappointment at work. There is little he doesn’t understand about the way we work now. He is both captain and our number one team player. 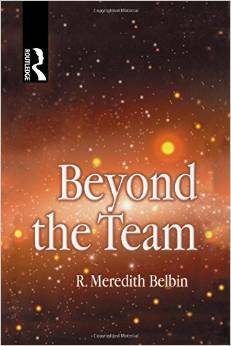 In Beyond the Team, Dr Belbin draws on his extensive work with organisations worldwide to give further insights into the workings of teams and groups. Jobs need to be actively interpreted, and the balance between Team Roles and functional roles, constantly revised. Dr Belbin explains how the increasingly complex demands of work allocation can be aided by a colour-coding system, as tested in international trials. Dr Belbin introduces Work Roles, a system of communication based on colour, which allows space for sensitive feedback and has especial value where members of an organisation do not share a common language. Beyond the Team shows how the mature team can eventually learn to distribute work between its own members, by giving a comprehensive understanding of how to manage both Team Roles and Work Roles. People in teams have not been brought together merely to engage in social relationships: they are there to perform a body of work! What ever happened to empowerment?